American and Chinese military chiefs have argued over US exercises in the South China Sea, after high-level talks in Beijing. Chinese army chief Gen Chen Bingde said the exercises with the Philippines and Vietnam were "extremely inappropriate". But at a joint news conference, Adm Mike Mullen said the US would continue to support its allies in the region. Overlapping territorial claims in the South China Sea have sparked tension in recent months. China, Vietnam and Taiwan all claim sovereignty over huge areas of the sea, including the Paracel and Spratly island groups. The Philippines, Malaysia and Brunei also claim overlapping areas of territory. The US has recently held joint drills with the Philippines and is planning a similar move with Vietnam, saying the exercises are part of a regular schedule. But Gen Chen accused the Americans of repeatedly promising not to intervene in the South China Sea while "sending the opposite signal to the world". "It carried out joint military exercises in the South China Sea with Vietnam and the Philippines, although they did it before, it is extremely inappropriate to do it at this particular time," he said. Gen Chen went on to suggest that the US spent too much money on its military, and said it would be a "better scenario" if the government spent more money on improving the livelihoods of its people. Adm Mullen, who is in China for a four-day visit, rebuffed the criticism and insisted that the US would continue exercises with its regional allies. 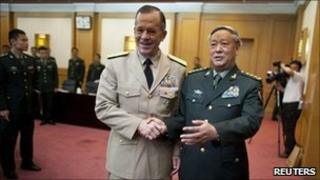 Before the meeting, Adm Mullen had expressed concern about the growing row between China, the Philippines and Vietnam. He warned that misunderstandings could lead to "an outbreak that no-one anticipated". In a speech to university students, he said: "The United States is deepening its commitment to this region and the alliances and partnerships that define our presence there. "We are, and will remain, a Pacific power, just as China is a Pacific power." During a visit to the US in May, Gen Chen said China had no intention to match US military power. He said America's armed forces remained far more advanced than China's despite considerable progress by China in recent years. Correspondents say both sides are trying to boost military co-operation, but there are still significant underlying tensions. As well as the recent spike in tension in the South China Sea, the two nations also have a history of acrimony over Taiwan. In 2010, Beijing severed military contacts with Washington in response to US arms sales to the island. China regards Taiwan as part of its territory.